UPDATED: Tue., Aug. 7, 2018, 11:12 p.m. 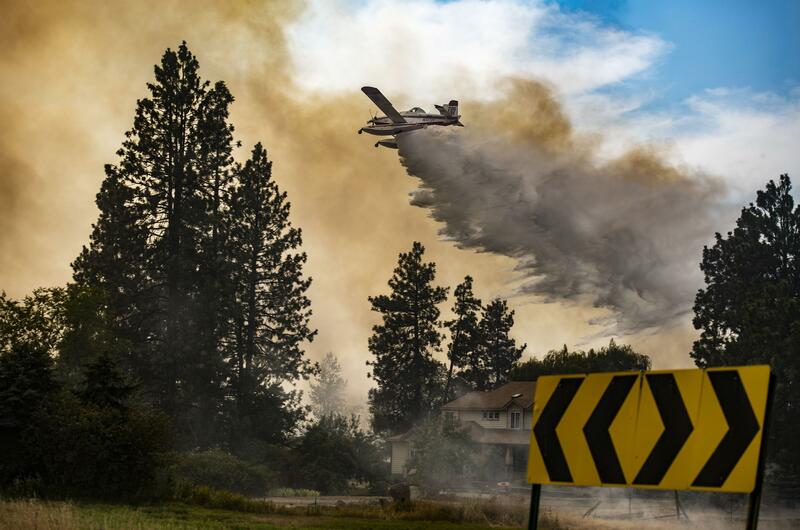 The worst of the Silver Lake fire burning along Interstate 90 near Cheney is likely over as residents return home and firefighters focus Tuesday on mopping up hotspots. The fast-moving grass-and-brush fire started about 1 p.m. Monday and forced mandatory evacuations for up to 100 homes, which were lifted Monday evening. Fire officials said 55 homes were still in danger, though they didn’t expect the roughly 100-acre fire to grow or spread further, as it was 100 percent lined. Only one building was destroyed in the blaze, said Cody Rohrbach, Spokane County Fire District 3 fire chief. He said it was likely a trailer or shed. No injuries were reported by residents or firefighters. Guy Gifford, spokesman for the Department of Natural Resource’s Northeast Washington Interagency Communication Center, said about 100 fire personnel were still working the fire Tuesday morning – three hand crews, 13 fire engines and two water tender trucks. By Monday evening, Rohrbach said the fire was 100 percent lined, though only about 20 percent was contained, as the majority of the fire had yet to be checked for hot spots. He said firefighting efforts ran into trouble Monday night when a smoke inversion mixed with a southward wind and pushed smoke across the interstate, reducing visibility. Because of the nature of the fire, Rohrbach said, getting an accurate picture of the blaze was proving difficult. He said it started near exit 265 on the south side of the interstate and stretched about 5 miles to the east and west, with some growth to the south. Veronica Randall, another spokeswoman at the Department of Natural Resources, said the official cause of the fire was attributed to burning material from a vehicle passing on the interstate. Tuesday morning, the Spokane Regional Clean Air Agency issued an air quality alert through Friday for Central and Eastern Washington because of smoke from area wildfires. As of 1 p.m., Spokane-area air quality was “unhealthy for some groups” on a 5-point scale ranging from “good” to “hazardous,” according to the agency’s index. The agency forecast Wednesday’s air quality would be “moderate,” a step down from good. Published: Aug. 7, 2018, 10:48 a.m. Updated: Aug. 7, 2018, 11:12 p.m.